(Gosh, can anyone guess how many times I've used a Beatles song for a post subtitle?) Again with the craziness! This week-end is going to be one of my silent ones, comment-wise, as I'm currently in a rush to pack respectable (read: physician-style) clothes and gifts for half the Filipino population in the US, as well as make the finishing touches on my application for residency in the United States (the applications are electronically sent to the program directors on September 1. AAAGH!!). I know I said I'd share part 2 of my New York experience from last Winter, but those posts take the longest to write, and I'm trying to save time, so I'll get to that post when I've settled. After Greenville, it's interview time once more till late January, but I think I'll be able to post and visit your beautiful blogs even when I'm in the States. Next week-end, I'll post #8 of my Tartine bake-through with Lisa. These are my third attempt at macarons (the second one was a complete disaster due to several factors). I think with more experimentation, I'm getting better at them. It really is a matter of getting to know the process and understanding your equipment. And doing it as level-headedly as you possibly can. Thanks goodness Gourdo's had a 70% discount on slivered almonds-- they only cost about US$1 for 100 grams (they were going to expire in 3 months). Plenty of room for experimentation. To save time when I decide to make macarons, as soon as I get the almonds, I grind them with an equal weight of powdered sugar and sieve them multiple times during the process. I stored the almond-sugar powder in an airtight container and kept it in the fridge-- ever-ready for when I have time to make macarons or need to make a joconde or such. Because my oven is fan-forced, it unfortunately only has a heating element at the top. As a result, my macarons' feet are pathetic. To partially compensate for this, I preheated the oven with a baking stone at the bottom. I also took care not to over-insulate the bottom by using too thick a baking sheet. The results are acceptable for now, to me. I'm satisfied with a good texture and smooth top. To make the flower pattern, I used a stencil. Because I don't have an airbrush, I simply used Wilton's Color Mist spray frosting color -- a very inexpensive solution. 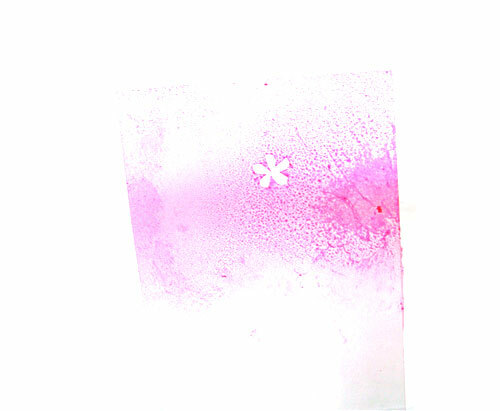 I carved the flower on a piece of acetate and sprayed through it from about 7 inches away for a fine mist. The filling is white chocolate ganache with cherry preserves folded in. I started out with a scant amount of filling that was too runny because of the heat, so I only put a measly amount in each-- a mistake. 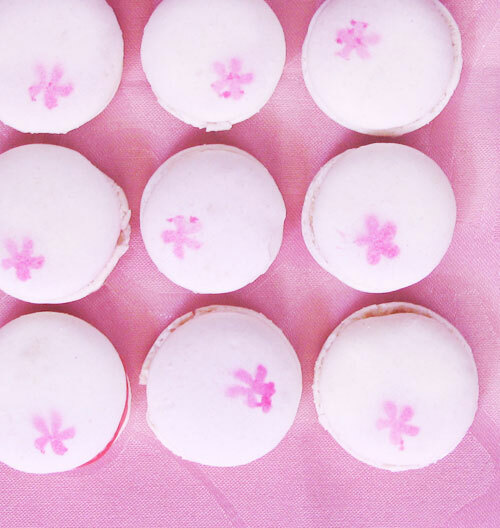 I learned in subsequent trials (which you'll see in the future), be generous with the filling to get that classic macaron bite. On my next batch, I was thrilled to find that biting into one of mine was almost like biting into one of Paulette's. 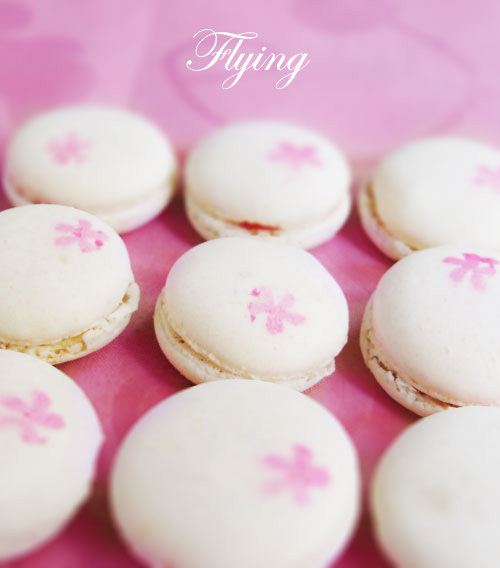 If you're very interested in learning more about macarons, check out our review of Pierre Herme's book Macaron at The Gastronomer's Bookshelf. Also, my go-to guy is Duncan for his series on Macarons. Julia has also compiled an impressive number of links and tips on her site. If you'd prefer using the French meringue method, Helen has a tutorial at Desserts magazine (requires membership).